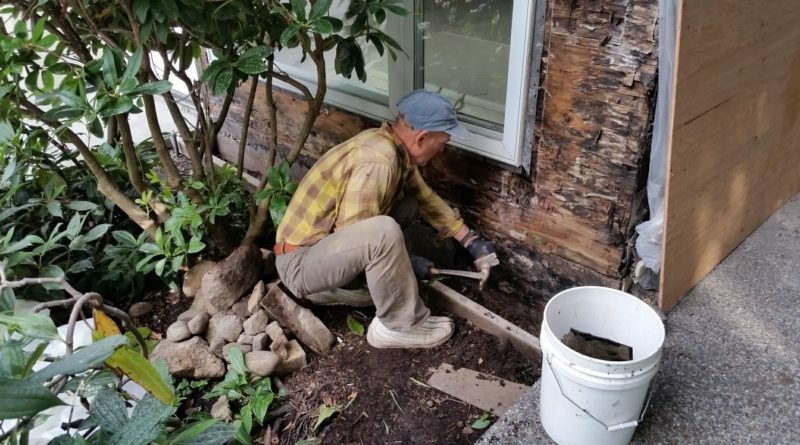 A West Vancouver home inspector returns with a contractor to to investigate deteriorating stucco. The results were distressing both to the home owners as well as to the building envelope. Back in the 1980’s to mid-1990’s there was an architectural style of flat roof with no roof overhang. In many cases it was used with an acrylic stucco exterior smooth trowel finish. The problem with it was, that at the time, there was inadequate knowledge on how to make watertight such an exterior shell and as a result rainwater and snow-melt were able to penetrate in behind the stucco and cause massive (and expensive to repair) rot damage to the wall framing systems, along with unimpeded mold growth. In this particular case, the home inspection report for a West Vancouver residence clearly stated that the exterior stucco finish was showing signs of distress (flaking, cracking, bubbles, rust stains) and further evaluation was required by a competent contractor to perform cut tests on the stucco in order to inspect the wall framing system behind the exterior. In locations where the plywood backing was in good condition, the surface was damp, even though it had not rained for a week. This indicated that there was trapped moisture within the wall with no means of ventilating or drying itself out. Where there was a visible crack on the surface, behind the stucco there was corresponding rot. This rot penetrated the plywood sheeting, travelling both horizontally and vertically a surprisingly long distance. Where there was distressed stucco around windows, there was considerable rot around the windows, along the sides and below, indicating inadequate or ineffective drip edges and flashing. Where there were pillars and walls two to three stories high, at the bases the plywood backing was completely rotted out and in some cases it had the consistency of garden soil behind the stucco. Clearly this is an issue that the homeowner will now have to address, either spot remediation or whole wall and window replacement. However in this case our homeowner had purchased the property, with eyes wide open, for lot value with the expectation that there may be significant issues with the building. Those issues are now front and centre in the homeowner`s deliberations.